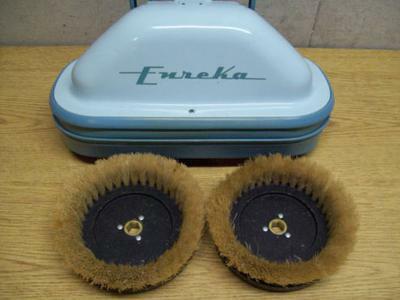 Hi, I have a vintage electric Eureka floor scrubber/polisher. I want to get new scrubber heads or brushes. Not sure what they are called. The attached picture is on I found on google, and looks exactly like the one I have. There are two circular brushes that spin. Each is originally about 5 3/4" wide, the bristles were at least one inch long when new, though probably a bit longer. They each have a 13mm hex shape in the middle to attach to the same shaped attachment on the machine. I called Eureka, but they said they discontinued that item, so replacement brushes are not available from them anymore. If I can't find the right brushes to fit, my next idea would be to find brushes that are similar, and just fabricate a hex center in the brushes so that they will fit. Please help if you can. Advice would be appreciated. I've looked for replacement scrubber heads for your vintage Eureka as well; unfortunately I didn't have any better luck than you did. And since you've already called Eureka and they can't help, your best bet is do that search for brushes that are similar and will fit the machine. That say, while most of us prefer to shop online for the ease, convenience, and ability to price-check before we buy, in this case I'd recommend you first take the Eureka to a physical appliance repair shop. Perhaps they have older parts, or know companies that do. If not, ask them about what parts are available that would fit your machine. In this case, an appliance expert is your best bet for keeping your floor scrubber in action.